Things have been coming along really well with this prop. When we last left off I had just put it in paint. After a second coat of paint (that got rid of a lot of those spots left from the other can), the next step was to start the details. Skull- The goat skull on the top of the axe was my first order of business. 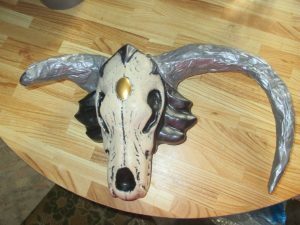 The skull itself is plastic, a detachable part of the belt of a Warcraft movie Durotan costume I bought for the bodysuit. 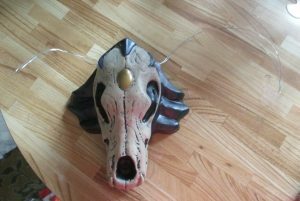 Getting the skull as well (and a mask I can paint later) was a bonus. I started by making two small holes in either side and threading some wire through. 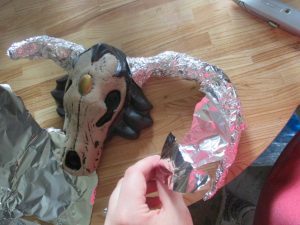 It's not heavy wire, and I will definitely use something thicker when doing the horns for my helmet, but for this it worked quite nicely. After the armature was in the proper position I dropped a little hot glue on the holes I'd made and on the wire that crossed the back of the piece to keep it stable. Then I started wrapping the foil. It's just regular aluminum foil, nothing fancy. 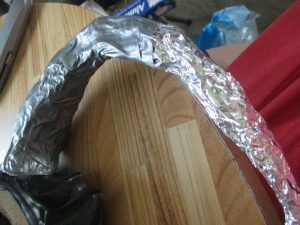 Once you are satisfied with the foil, then start wrapping the tape. I used the Handyman's Secret Weapon, duct tape. 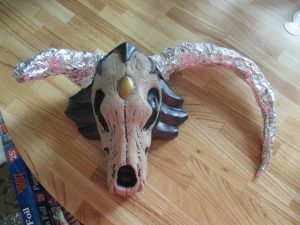 I also popped a little bit of hot glue underneath the seams where the horns join the skull just for extra security. Now to mount the skull to the axe itself, it was a bit of a quick and dirty thing, to be honest. I glued a piece of foam inside the skull and then wrapped it around the top of the axe handle and duct taped and hot glued the whole works in place. All that will be covered later but it seems to be holding well so far. Fingers crossed. 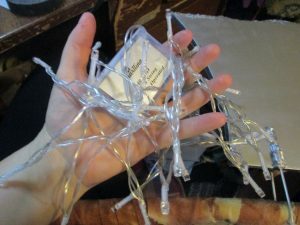 Lights- Now this is a fun part. And frustrating. First up, the lights themselves. 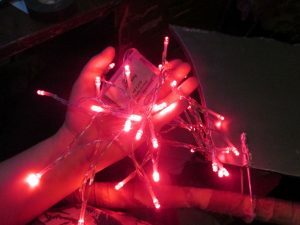 A set of red string lights, battery operated. We (the elder spawn gave me a hand with this), counted the lights and came up with an arrangement: 3 per spike and two in between, on both sides. I've only got the one side done right now because I actually ran out of glue while I was doing this. 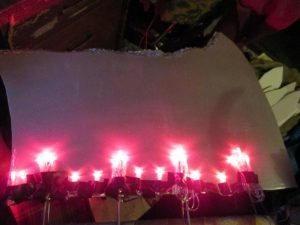 The lights and wires are held down with electrical tape. 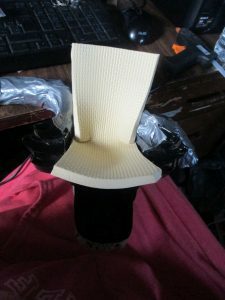 The foam spikes are hot glued over top and to the handle. 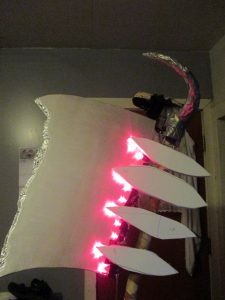 There will be a set of lights and spikes on both sides, and the spikes will be glued together at the tops. But it's really starting to look like the in-game weapon and I'm pretty stoked to see it finished. It's gained some weight with all the additions, including the battery pack stashed on the underside of the skull, but I've so far kept it from getting too heavy. Thankfully. We went into the city over the weekend to get some things. While there, we hit some thrift shops looking for costume supplies. It's was very fruitful, and I don't just mean all the books I bought. 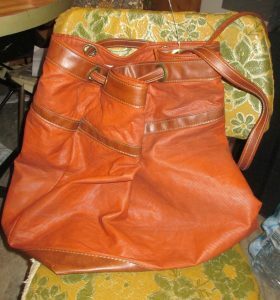 Treasure Goblin bag- I saw this, actually sitting on the floor in the purse/bag area, and it was perfect. It's a good size for the elder spawn and looks pretty much perfect. It doesn't even really need any work other than maybe a bit of weathering. An awesome find. Leah clothes- I've been wanting to get my hands on some stuff for the younger spawn's costume, as her's is mostly clothing. Again, got lucky. The next time we go in I'll be getting some dye for the shirt (I found one with the rather interesting name of 'burlesque red' that I think is about right) and the vest will get a rather large overhaul, but this really is the main part of her costume. I have a necklace ordered as well, and I hope it arrives in time. Day 2 stuff- The con is two days. 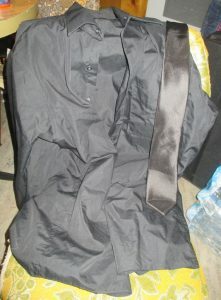 I'll be wearing the full armor the first day, but for the second one I wanted something a little more relaxed. 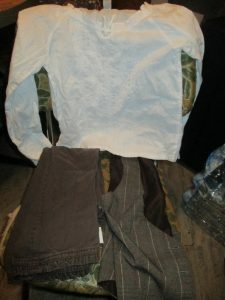 While I'm not announcing what the costume is yet, here are a couple of the pieces. 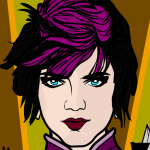 I also have a wig on the way for this one, too. The only thing I'll say is that me and the other half are doing a bit of a 'couple' costume on this one, and it's from a movie I really loved and he was more ambivalent about. Speaking of the other half, he got a few pieces to pretty much round out his gender-bent The Lost World: Jurassic Park costume. 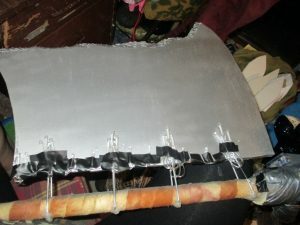 He's also been working like mad on his prop, and I cannot wait for the reveal on that one. It's gonna knock your socks off. As we wrap this up, I just have to put it out there. Did anyone watch the new trailer for Bohemian Rhapsody? Because I was interested in it before, but I am legitimately excited for it now. I also love Queen, so that might help. And Rami Malek looks so much like Freddie Mercury it's quite eerie. Speaking of movies, I'm hoping to sneak out a review for Godzilla: City on the Edge of Battle sometime this week or early next week. It just dropped, so I'm hoping to get a watch in soon. But that's it for now, see you next time! This entry was posted in Fantasy & Sci-fi and tagged 2018, cosplay, road to comic-con, trailers. Bookmark the permalink.